(DAVIDSONVILLE, MARYLAND) – Katie Ward was slowing down to make a turn when the eight-point buck sprang from the woods. Within a split second, the big deer bounded into the roadway, colliding with the front end of her brand-new vehicle. State Farm Insurance says there are 36,000 motor vehicle accidents involving deer in Maryland each year. Those 36,000 accidents have an average cost of $4,000 to $6,000 each, for a total cost of about $180 million dollars annually. It cost $3,500 to repair Ward’s car. She works at Maryland Farm Bureau, where her co-worker Colby Ferguson has been tracking the state’s burgeoning deer herd. 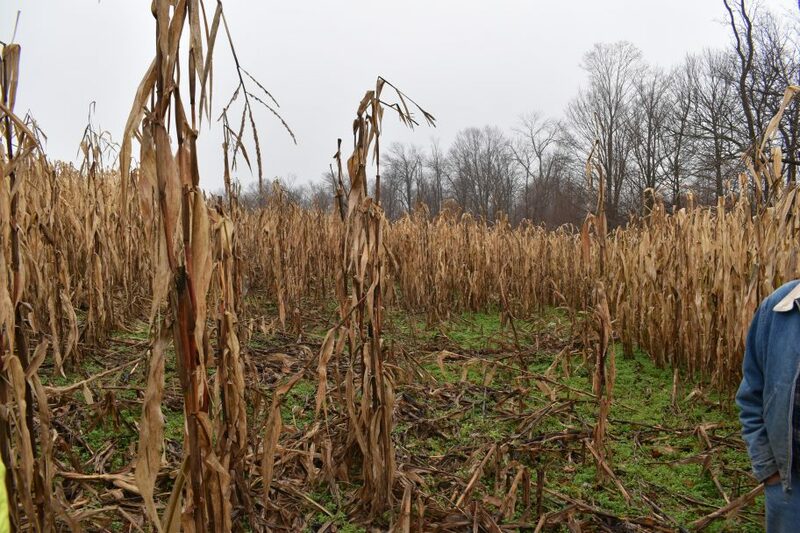 His best estimate is that deer and other wildlife, like black bears and Canada geese, cause an average of $50 per acre in damage to farm crops in Maryland, running up a tab of $60 million in lost revenue for Maryland farmers each year. The deer herd is exacting a toll on Maryland’s public parks and woodlands, too. 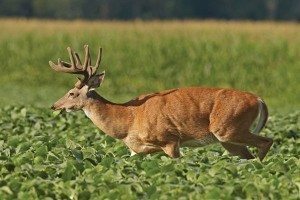 Deer forage on trees and undergrowth that provide crucial habitat for other species. Forested buffers and common areas in parks and neighborhoods that provide environmental benefits by serving as nutrient traps are being destroyed, Ferguson adds. His best tips for saving your car — and your yard — from deer? Deer rarely travel alone. When you see one, slow down. There will be more. Try honking to discourage the rest of the herd from crossing the road in front of you. Remember that deer are more active at sunrise and sunset. Brake, but don’t swerve. Swerving can result in a more dangerous crash. There are many different kinds of deer repellent available for the home gardener. Choose one, and monitor its effectiveness. Over time, deer will become accustomed to the smell and you will need to try a new one.